If the scatterplot doesn’t indicate there’s at least somewhat of a linear relationship, the correlation doesn’t mean much. Why measure the amount of linear relationship if there isn’t enough of one to speak of? However, you can take the idea of no linear relationship two ways: 1) If no relationship at all exists, calculating the correlation doesn’t make sense because correlation only applies to linear relationships; and 2) If a strong relationship exists but it’s not linear, the correlation may be misleading, because in some cases a strong curved relationship exists. That’s why it’s critical to examine the scatterplot first. Scatterplots with correlations of a) +1.00; b) –0.50; c) +0.85; and d) +0.15. The above figure shows examples of what various correlations look like, in terms of the strength and direction of the relationship. 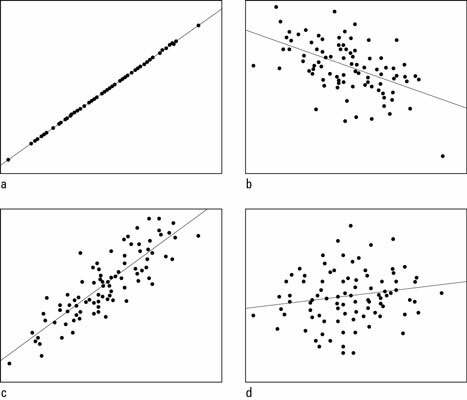 Figure (a) shows a correlation of nearly +1, Figure (b) shows a correlation of –0.50, Figure (c) shows a correlation of +0.85, and Figure (d) shows a correlation of +0.15. Comparing Figures (a) and (c), you see Figure (a) is nearly a perfect uphill straight line, and Figure (c) shows a very strong uphill linear pattern (but not as strong as Figure (a)). Figure (b) is going downhill but the points are somewhat scattered in a wider band, showing a linear relationship is present, but not as strong as in Figures (a) and (c). Figure (d) doesn’t show much of anything happening (and it shouldn’t, since its correlation is very close to 0). Many folks make the mistake of thinking that a correlation of –1 is a bad thing, indicating no relationship. Just the opposite is true! A correlation of –1 means the data are lined up in a perfect straight line, the strongest negative linear relationship you can get. The “–” (minus) sign just happens to indicate a negative relationship, a downhill line. How close is close enough to –1 or +1 to indicate a strong enough linear relationship? Most statisticians like to see correlations beyond at least +0.5 or –0.5 before getting too excited about them. Don’t expect a correlation to always be 0.99 however; remember, these are real data, and real data aren’t perfect.